Sunday, May 19 - deadline for guaranteed t-shirt size and for submitting Volunteer information, team member waivers and team's average 10k time. Teams registering after 5/19 should have their volunteer information ready with registration. Monday, May 20 - Start Times posted on the TEAM STATUS PAGE for Teams who have submitted volunteer info, team's average 10k time, and have signed team waivers. Sunday, June 2, 4:00-5:30 pm - Captain's meeting/packet pick-up to get bibs, t-shirts and vital, crucial, can't live without it team info. Hosted by Gorgeous Series Sponsor Foot Traffic, who is generously offering 10% off while you are there for the meeting -- Foot Traffic NE, 4020 NE Fremont. Teams must have submitted all volunteer information and submitted all waivers and 10k time to get packets. Out of town teams that notify us they can't make packet pick-up will receive Captain's meeting info by email the following day and can pick up packets race morning. Sunday, June 9 - Race day! 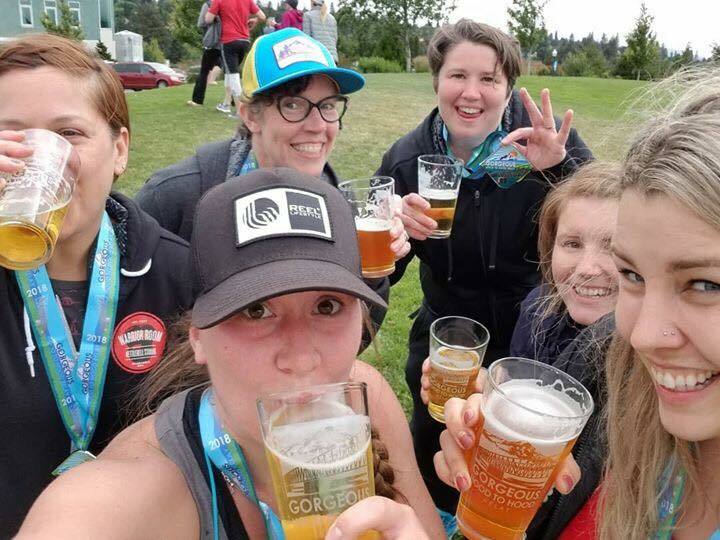 Swag - All runners receive a t-shirt, finisher's medal, pint glass and free beer Hood River's own Pfriem Family Brewers at the finish - Gorgeous! Teams will launch in waves starting at 7:00 am. Start times will be posted 5/20/19 for all teams who have submitted waivers, estimated 10k times, and volunteer information. This information is also required for receiving team bibs. Teams must average an 11:30 minute per mile pace. Exchanges will close after the 11:30 per mile pace window. Teams that are not accurate with their submitted 10k time may get ahead of or behind the volunteer coverage and could be held or asked to skip ahead. Unfortunately, you won't be allowed to see if your team members have signed their waiver. If you didn't sign the waiver during registration, RunSignUp sends an email with a link to sign the waiver to the email listed for the runner in the system. Starting one week before waivers are due, we will send a reminder email to runners that need to sign their waiver, and a running list on the TEAM STATUS PAGE starting May 12, 2019.